The last seven days have been busy for any in education, including yours truly. I had 4 days out of school serving as a team Inspector on an ISI Inspection team. Those left back at home got seriously on with some teaching, learning and experiential education stuff, and (it must be said) things back at school have gone very well in my absence*. For those not in the know, ISI Inspection teams visit the target school on Tuesday to Friday, with the core Regulatory inspection checks happening on Day 1. As I am just a Team Inspector for Curriculum Group 2, I get to arrive for Tuesday evening with the other team members, get briefed on day 1 outcomes, before getting stuck into seeing lessons and events for the next 3 days. ISI outcomes are Team judgements, corporately agreed, and provisional outcomes are shared with the headteacher over the days building up to day 4 (Friday) so that there are no big surprises on the final day to the Chair of Governors/Proprietor, the head, or the senior management. As with the school I have just visited, it’s great to be able to feedback so very many positives, and to feel that my independent verification of what the school does in its daily life had given the school valediction for its great work. ISI are recruiting for Senior inspectors and Reporting Inspectors just now, so unless you are already leading school inspections, then currently no vacancies exist, However, if you are an Assistant head of above, do think about applying – Inspecting other schools is both a great privilege and the best CPD for teachers ever, so keep a monthly check on the ISI site for signs of the training door reopening. http://www.isi.net/home/ ISI seem to be recruiting boarding inspectors just now though, so do have a look at this if you qualify. Now the thing about schools that some headteachers don’t get is that the DfE require schools to be compliant to the Regulatory standards – find the checklist here. If a school is not compliant to Regs, then whilst the head and chair of governors might feel they could still deserve to be excellent, actually they can’t be, because excellence is linked to meeting all standards. That’s actually the bare minimum. Despite the heads’ associations doing their best, heads don’t seem to understand this, seem unable to prioritise appropriate attention, and so our sector struggles to be compliant. Currently something close to 30% of our schools don’t meet Regs. And for failures on Regs relating to Welfare, Health and Safety, this reduces the Inspection’s teams ability to award excellent to Governance, to Leadership and Management and to Welfare, Health and Safety. During an Inspection, the school may have time to put these failings right, so that they are compliant by the end of the 4 days inspection. But currently as things stand, even though matters may be corrected, the school will still be advised by major recommendation to put robust procedures in place. In short, getting the Regs right is essential, as without these, the school’s efforts to be regarded as sound, good or excellent are unlikely to be confirmed. You can read a little more on this on a commercial website, specifically relating to OfSTED inspections, but as ISI inspects ISC schools as the OfSTED franchise, the advice holds true. Be careful then of Limiting Judgements. Most of us remain confused about precisely what the ‘Web’ is. So in celebrating its birthday, actually who/what are we inviting to party? ⃠ Not the Internet, that thing made up of wires and switches that links continents and provides the backbone on which the Web can ride. ⃠ Neither are Skype, Filesharing, Streaming media etc. the web either. They are applications too that can be found on the Internet. ✓ The Web are these pages, with hyperlinks joining pages together, in which can be embedded gadgets, video and the like. Web 2.0 takes static pages and makes them editable, such as blogs, eBay, webservices, YouTube and mash-ups. Web 3.0 is just arriving, the Semantic web that makes as much of the data available to you as possible. Think about the eerie way adverts can now pop up on your mobile and link you to something you were looking for? The way searches now seem to know you and your likes and dislikes and don’t bother pushing ideas that your data tells it you won’t like. It was Tim Berners Lee’s boss at CERN who dismissed his ideas for the Web as ‘vague but interesting’ – given that it has transformed the 21st century in a way that printing did the 15th century, and that it has become a major crucible for innovation and democratisation, his boss was not right! A nice Guardian article that gives you 25 birthday ideas here. By way of highlighting what the Web will be able to do in 5 years time, here’s a nice advertorial from IBM – from classroom to city, the ‘intelligent’ technology will translate our data and ‘improve’ our life chances in the process. Perhaps they will, but don’t hold your breath. 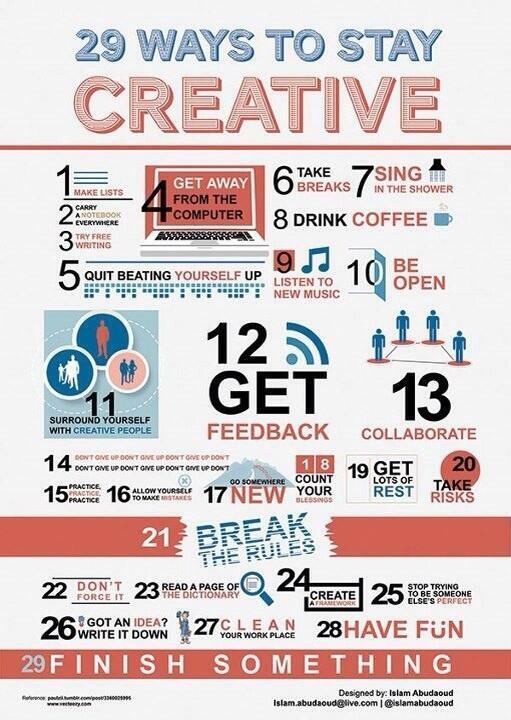 29 ways to stay creative – from the PBS people. As the poster makes clear, there are so many ways us boring people are actually being really creative – like making lists. The Blunders of our Governments by King and Crewe, covering the outrageous failures of the last 30 years in the UK. Independent Thinking – Ian Gilbert (Kindle), a wonderful celebration of how education should be about adding values not just value. “Do things no one does or do things everyone does in a way no one does” got me reading straight away! Did you hear about the cross-eyed headmaster? He couldn’t control his pupils.